Snuggled in one of the Pacific Northwest’s coziest towns, Gig Harbor provides a beautiful backdrop to The Lodge community. That being said, we believe some of the best treasures can be found within our community at The Lodge. 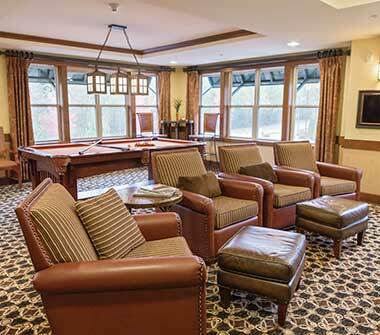 With top-notch apartments and cottages, The Lodge offers fun and exciting amenities that residents can enjoy. Whether you are dining in our elegant dining room or indulging in the fine finishes of our common areas, The Lodge prides itself on extreme attention to detail and a variety of offerings. With exceptional care provided by The Lodge team, whether you are seeking independent or assisted living, The Lodge is designed with your enjoyment in mind. With a wide array of social events and amenities like these, you may never leave! Contact us today to learn more about our offerings and schedule a tour.